After reading so many rave reviews for Becky Albertalli's debut novel, Simon vs. the Homo Sapiens Agenda, I decided to pick it up. I absolutely loved this book and it is on my favorite list for this year. If you haven't read this book yet, I highly recommend picking it up! Review: Change-averse Simon Spier is forced out of his comfort zone and comes out to friends, family and classmates after his secret correspondence with a boy named Blue is discovered. 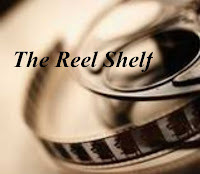 Simon is blackmailed by his classmate Martin who uses Simon's sexual orientation as leverage in order for Simon to become his wing man and help Martin woo Simon's friend Abby. While Simon doesn't see his own sexual identity as a big deal nor think his supportive parents and friends will do so either, he is not so sure about his school's reaction and more importantly outing his crush Blue. Simon is a character that I instantly loved. His voice is of an authentic teen, snarky yet sweet, funny, and very observant. Though his point of view is written in prose, I always felt as if he was sitting right next to me on the sofa telling me his story. Simon is impulsive and wears his heart on his sleeve, which is why his email exchange with an anonymous classmate who calls himself Blue is definitely the highlight and my favorite parts of the book. Due to their anonymity, the emails between Simon and Blue are honest, flirtatious, and emotionally intimate as they open up to one another. The romance with Blue is sweet and subtle and it doesn't overshadow their important talks. I liked how Blue's identity remained a mystery until the end of the book and I was very pleased to find out who he turned out to be. It is because of Blue's strength and brave steps in coming out to his own parents does Simon really consider doing the same. Simon's blackmail situation is just more of a push in that direction. Though the book can be seen as yet another "coming out" book, the author never makes this big event heavy handed. It takes a while for Simon to realize that his issue isn't about coming out and being honest with himself, but rather how his big moment is overshadowed by blackmail and his turn to celebrate who he is and coming out on his terms are stripped away from him. When his secret is revealed, Simon does suffer from bullying at his high school, but he is also loved and supported by his friends and school administrators. The suspense surrounding Blue's identity becomes even more intense as Simon is outed. In addition to Simon, the secondary characters are also well developed and fleshed out though they do have less page time. Through light and often humorous detail, readers see clearly not only each individual character, but also the complex set of group dynamics at play in Simon's loving family and circle of friends. These characters also go on their own journeys and find themselves just like Simon though I wished they were present a bit more. 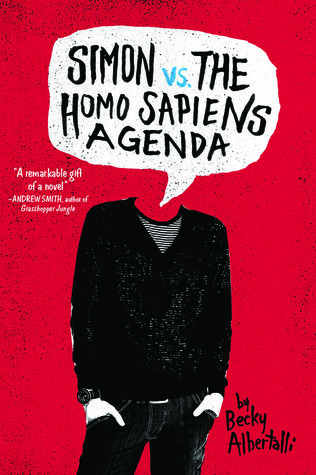 Overall Simon vs the Homo Sapiens Agenda is a nearly perfect novel and my favorite debut novel of the year. Funny, moving, romantic, and emotionally wise, this book will make you sigh in content and have a huge smile on your face when you are finished reading the last page. Words of Caution: There is some strong language in the book, scene of underage drinking, allusion to masturbation, homophobic slurs, and crude humor. Recommended for Grades 9 and up. Sort of been on the fence about this one. I do have it in my library so now I'll pick it up for sure! Thanks. I, too, loved the book with one little caveat...the trip to Atlanta and the gay bar. Um...I thought that was out of order. But I have recommended this book to a lot of my readers and bet it will show up on lists of books with awards after the ALA mid-winter meeting convenes in January. I'm so glad you liked this one! It's one of my favorite books of the year. Maybe my favorite in fact. I agree that it's near perfect.